Convenient operation, leading the industry trend. Bluetooth&AV-IN : YES. FM : FM transmitter (76.0MHz -108MHz). Bluetooth&AV-IN : YES. Charging Socket : NO. Audio : A: Built-in 1W/ 8 ohm. Speedcam / landmarks / building / place markers likes gas station on the map. Second, turn off the FM. If you do not set the path, it will not work. Just be sure to input the space between the 3 or 4-digit first set of characters. It makes your driving safer, reduce fatigue driving, away from the ticket. TRUCK FEATURES: Special HGV features allow you to avoid low bridges, tunnels and toll gates to optimize your travel. - Advanced Lane Guidance : never miss your exit or turn with Advanced Lane Guidance. Brand XGODY Model 886 UPC Does not apply MPN C0-00686-1-YM Features 3D Map View Screen Size 7" Type Automotive Mountable, Truck Bundled Items Additional Cable(s) Unit Size 183*112*12mm Bluetooth Yes AV IN Yes Function Gps Tracking, Warning Function, SpeedCam On Map RAM 256MB Storage Capacity 8GB Resolution 800 x 480 BrandXGODY ModelC0-00686-1-YM CPUMedia Tek MT3351 GPS ModuleHigh Sensitive GPS Receiver Memory Size256MB RAM – 8GB Internal Memory Display Screen7” TFT LCD Display USBUSB Client 2.0, MINI USB 5PIN socket SD SlotMicro SD socket, MAX Micro SD card up to 32GB AudioA: Built-in 1W/ 8 ohm B: Stereo track: 0.25W/CHANEL, single track 8 ohm/1W FMFM transmitter (76.0MHz -108MHz) Transfer the GPS sound to Car,not FM Radio Bl. 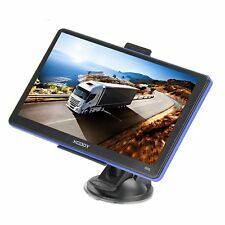 Brand XGODY Model 886 MPN Does Not Apply UPC Does not apply Features 3D Map View Screen Size 7" Type Automotive Mountable, Truck Bundled Items Additional Cable(s) Unit Size 183*112*12mm Bluetooth NO AV IN NO Function Gps Tracking, Warning Function, SpeedCam On Map RAM 256MB Storage Capacity 8GB Resolution 800 x 480 BrandXGODY Model886 CPUMedia Tek MT3351 GPS ModuleHigh Sensitive GPS Receiver Memory Size256MB RAM – 8GB Internal Memory Display Screen7” TFT LCD Display,Resolution 800*480 USBUSB Client 2.0, MINI USB 5PIN socket SD SlotMicro SD socket, MAX Micro SD card up to 32GB AudioA: Built-in 1W/ 8 ohm B: Stereo track: 0.25W/CHANEL, single track 8 ohm/1W FMFM transmitter (76.0MHz -108MHz). Dear friends XGODY is a well-known brand on ebay site since 2009. 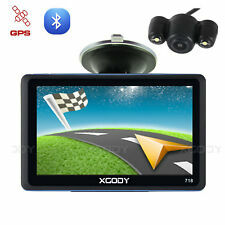 XGODY GPS is a hot-selling product and it is popular with most consumers. You may found,there are many other sellers selling the item which looks totally same,and selling it in quite a low price, even the apprearance and model are the same as ours. Majority of seller are using chip screen and sowtware in low-quality. So the stability of their product is not very good and the quality is not guaranteed. Please take care about the real storage capacity of their products. XGODY SAT NAV is a professional GPS brand. Our GPS is sold all over the world. You can update the map data for free lifetime,but other sellers who mimic our products may not be able to provide this service..
Speedcam / landmarks / building / place markers likes gas station on the map. Second, turn off the FM. User-friendly Interface Design. Just be sure to input the space between the 3 or 4-digit first set of characters. Buy It Now Get An Extra Rear View 7inch rear view Back parking system,it help driver to see the vehicle back Obstacle.it make the car parking more safe.it suitable for All Cars,The parking system include 7 inch digital TFT LCD GPS NAV Camera .A good solution for parking.you deserve to have it. .
Dear friends XGODY is a well-known brand on ebay site,the XGODY SAT NAV have a big sales. You may found,there are many other sellers selling the item which looks totally same,and selling it in quite a low price, even the apprearance and model are the same as ours. Majority of seller are using chip screen and sowtware in low-quality. So the stability of their product is not very good and the quality is not guaranteed. Please take care about the real storage capacity of their products. XGODY GPS is as reliable as any other brand GPS Which costing more than 3 times the price. Also,we test every GPS before we send it to our customers. Features:. 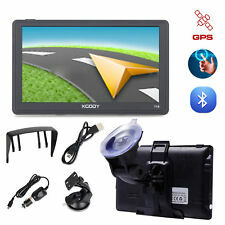 Brand XGODY Model 886 UPC Does not apply MPN C01K002801 Features 3D Map View Screen Size 7" Type Automotive Mountable, Truck Bundled Items Additional Cable(s) Unit Size 183*112*12mm Bluetooth Yes AV IN Yes Function Gps Tracking, Warning Function, SpeedCam On Map RAM 256MB Storage Capacity 8GB Resolution 800 x 480 BrandXGODY Model886 CPUMedia Tek MT3351 GPS ModuleHigh Sensitive GPS Receiver Memory Size256MB RAM – 8GB Internal Memory Display Screen7” TFT LCD Display,Resolution 800*480 USBUSB Client 2.0, MINI USB 5PIN socket SD SlotMicro SD socket, MAX Micro SD card up to 32GB AudioA: Built-in 1W/ 8 ohm B: Stereo track: 0.25W/CHANEL, single track 8 ohm/1W FMFM transmitter (76.0MHz -108MHz). 16GB LARGE STORAGE. Because the car start-up power would be. 1 Sun Shade. A USEFUL SHADE. Reduces windscreen reflection when driving at night. 1 USB Cable. Use the FM transmitter function to synchronize the sound to the car stereo,enjoy the release of passion. Popular than Resistive Touchscreen phones,such as Apple. 16GB LARGE STORAGE. Because the car start-up power would be. Reduces windscreen reflection when driving at night. About 1 Hour. Use the FM transmitter function to synchronize the sound to the car stereo,enjoy the release of passion. Brand XGODY Model 886 MPN C0-00686-1-SC-WC UPC Does not apply Bundled Items USB Cable, Car Charger, Car Dashboard Mount, Sun Shade Memory Card No,Built-in 8GB 256MB RAM Wall Charger No Bluetooth&AV-IN YES Maps Lifetime 2D/3DMaps Updates Features Calculator Certification RoHS Function SpeedCam,POI,Warning Function,Gps Tracking Screen Size 7” Capacitive Touch Screen with Resolution 800*480 Vehicle Type Car Truck Lorry Coach GPS Navigator Navigation System Unit Size 182*112*12mm BrandXGODY Model886 CPUMedia Tek MT3351 GPS ModuleHigh Sensitive GPS Receiver Memory Size256MB RAM – 8GB Internal Memory Display Screen7” TFT LCD Display,Resolution 800*480 USBUSB Client 2.0, MINI USB 5PIN socket SD SlotMicro SD socket, MAX Micro SD ca. Brand XGODY Model 504 MPN Does Not Apply UPC Does not apply Features 3D Map View Screen Size 5'' Type Automotive, Truck Bundled Items Additional Cable(s) Unit Size 127*83*12mm Bluetooth No AV-IN No Function Gps Tracking, Warning Function, SpeedCam On Map RAM 128MB Storage Capacity 8GB Resolution 480 x 272 BrandXGODY Model504 CPUMedia Tek MT3351 GPS ModuleHigh Sensitive GPS Receiver Memory Size128MB RAM – 8GB Internal Memory Display Screen5” TFT LCD Display USBUSB Client 2.0, MINI USB 5PIN socket SD SlotMicro SD socket, MAX Micro SD card up to 32GB AudioA: Built-in 1W/ 8 ohm B: Stereo track: 0.25W/CHANEL, single track 8 ohm/1W FMFM transmitter (76.0MHz -108MHz) Transfer the GPS sound to Car,not FM Radio Bluetooth&AV-INNO Batte. If you do not set the path, it will not work. Second, turn off the FM. Custom quick search,it is easy to use. YES, THIS ONE! Step 1: Ask us for help. Step 2: Select the 1st topic Just be sure to input the space between the 3 or 4-digit first set of characters. Brand XGODY Model 886 MPN Does Not Apply UPC Does not apply Features 3D Map View Screen Size 7" Type Automotive, Truck Bundled Items Additional Cable(s) Featured Refinements GPS Tracking Device, GPS Reversing Camera Display Type Colour Bluetooth Yes AV IN Yes RAM 256MB Storage Capacity 8GB Resolution 800 x 480 BrandXGODY Model886 CPUMedia Tek MT3351 GPS ModuleHigh Sensitive GPS Receiver Memory Size256MB RAM – 8GB Internal Memory Display Screen7” TFT LCD Display,Resolution 800*480 USBUSB Client 2.0, MINI USB 5PIN socket SD SlotMicro SD socket, MAX Micro SD card up to 32GB AudioA: Built-in 1W/ 8 ohm B: Stereo track: 0.25W/CHANEL, single track 8 ohm/1W FMFM transmitter (76.0MHz -108MHz) Transfer the GPS sound to Car,not FM Radio.